There is nothing like the fear of missing a connection to panic a traveller. 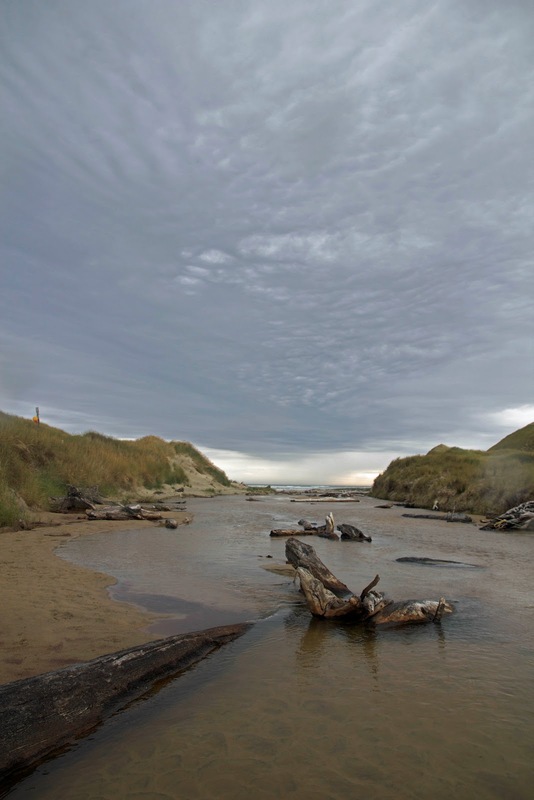 When you are walking, and the connection is with a boat that must leave at a fixed time because of tides, that sense of panic can be amplified. We'd spent the night in remote Mason Bay Hut on the wild west coast of Stewart Island, New Zealand's southern extremity. It had rained all night, and we were out of bed well before a pale, wet dawn. We had a three, or four, or maybe five hour walk - it depended who you listened to - before we'd get to Freshwater Landing for the water taxi we must not miss. That meant getting walking by 6-30am, unheard of in my usual walking company! Such time pressure, in concert with steady rain and a flat track, doesn't make for ideal walking. Talking loudly to hear each other through our rainhoods, Lynne and I discussed our disappointment at not having seen a kiwi here in one of their few wild strongholds. I had once held a kiwi during a behind-the-scenes tour of Auckland Zoo with a colleague, but there is nothing like seeing such a creature free and in its natural habitat. We had planned to also go to Ulva Island, a bird sanctuary in a Stewart Island inlet, so were starting to pin our hopes on seeing a wild kiwi there, when we were suddenly startled by the real thing. My experience of a captive bird's mute docility had, I suppose, lead me to think it would be a little like that in the wild. Far from being slow or placid, the large and lively bird flashed rapidly across our path, literally stopping us in our tracks. 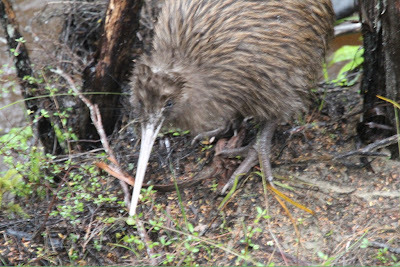 We watched for maybe fifteen minutes as the kiwi probed the damp forest floor for morsels: dipping, prodding, twisting, lifting its head, shaking, stepping, prodding again, its beak clacking like chopsticks in an expert hand. Its body shape reminded me somehow of a small wallaby's. But rather than hopping or loping, it walked with short purposeful steps, and ran like a pole vaulter with long strides, head and beak lowered as though ready for take-off. Of course it can't actually fly, instead relying on speed and camouflage to escape predators, of which there were few before predatory mammals were brought to Aotearoa. Now kiwi are rare on mainland New Zealand, making this sighting all the more precious. That we came across another one half an hour later added to the wonder. The sightings also slowed us down by a total of maybe twenty minutes. For such a privilege I decided I would be willing to miss my water taxi. But for the record, we made it with more than hour to spare. Wow! Don't know that I'll ever see a kiwi in the wild, but am sure glad to see that some folks do! Congratulations on the two sightings (not to mention for making it to the water taxi on time).